I was kindly sent the HANGSUN SR-150 WET/DRY to give yourself a pedicure at home. The market for healthy happy feet is at an all time boom with different models on the market to give yourself a hassle free pedicure at home. There is no more excuses to hide your feet in shoes anymore or go to a salon for a pedicure knowing your feet could be in better health, so u hide your guilt and don't make eye contact with the assistant transforming your feet. 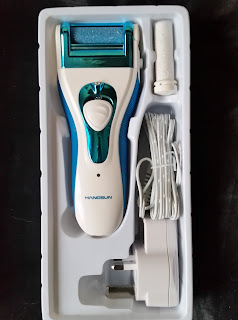 I have seen quite a few different models of these in shops and have wondered do they actually work or are they just a trend that is exactly that, a trend that u have to own but then u only use once and then sits in a draw for years. The HANGSUN SR-150 comes in a box that gives you some great information before u have even opened it. The roller can be used for a long time, you just need to purchase a new roller for replacement in the future. 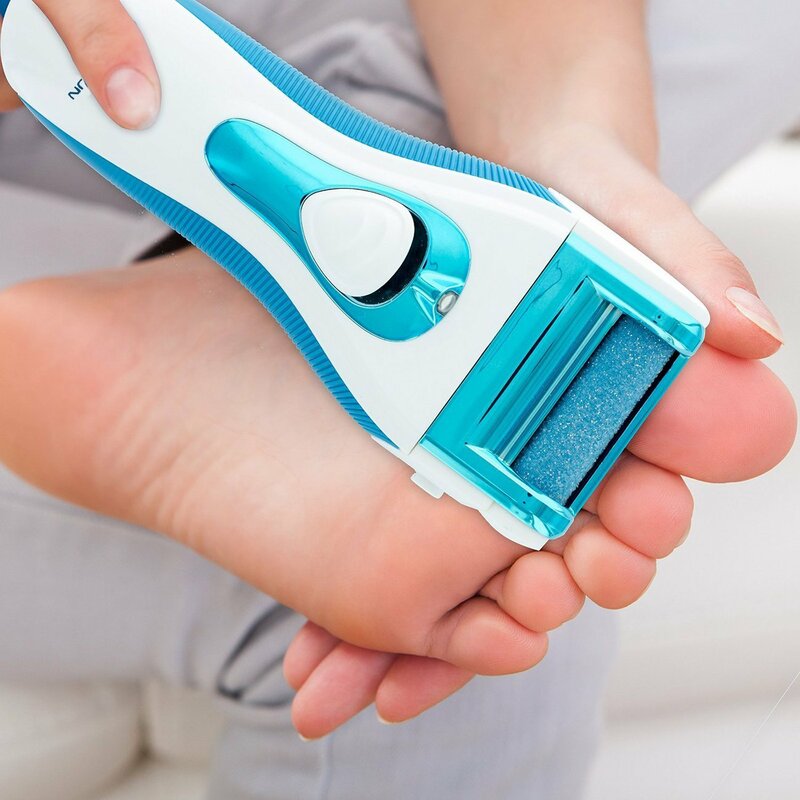 High 360* rotation speed instantly remove the dry skin issues on feet and heels. Washable for the whole body, we can clean it directly under water tap after use. 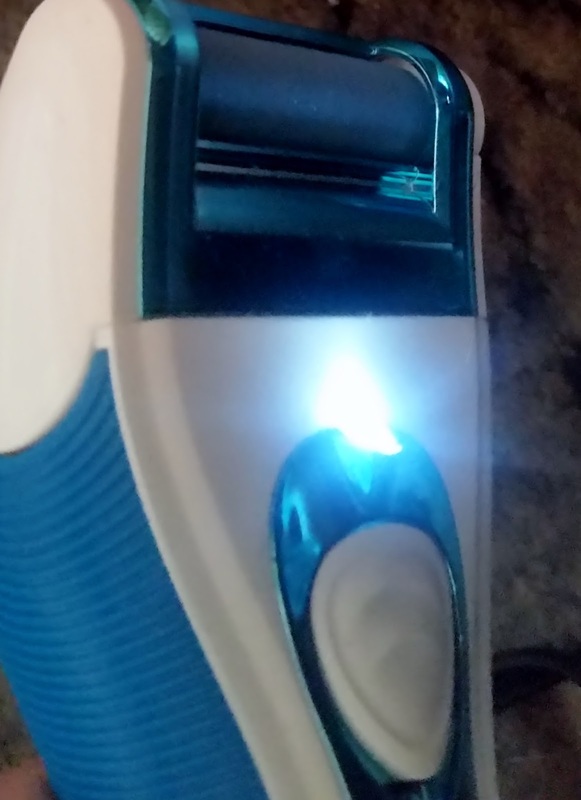 Don't need any professional skill, easy use like a razor. 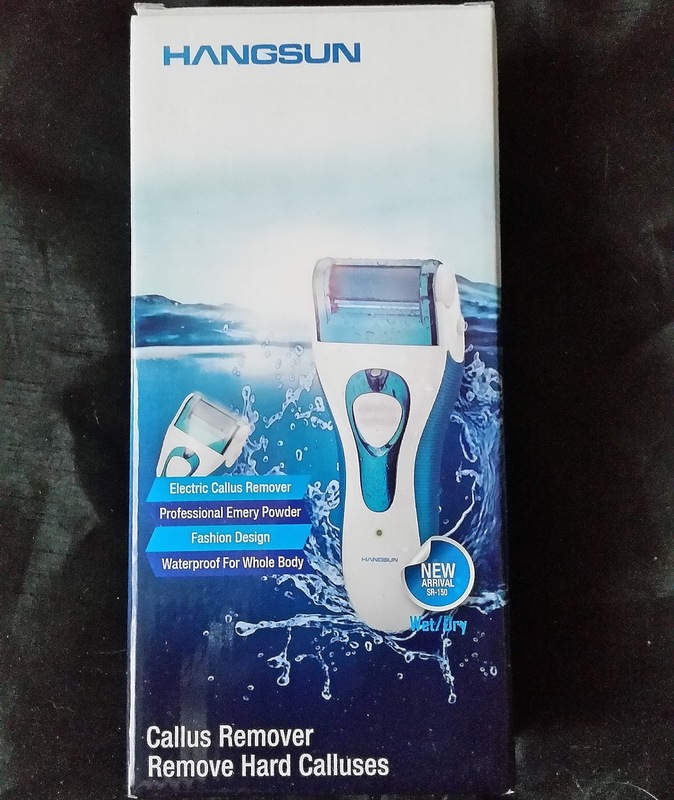 The callus remover is an innovative device created to smooth dry, rough and calloused skin on the feet. On opening the box i instantly like the colour of this device which is a shiny aquatic blue. There is also a plug to recharge this device or you can just plug it in and use straight a way. A cleaning brush is present along with an extra callous remover roller for when the other needs replacing. On picking up the device it feels quite comfortable in the hand with two rubber grips on each side of the device for easy and non slip handling. This device doesn't feel heavy at all and was quite surprised at how lightweight this feels. 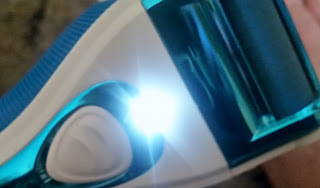 The on and off button is a switch on the front of the device that u cant miss and when switched on the LED smart light will come on which is white. 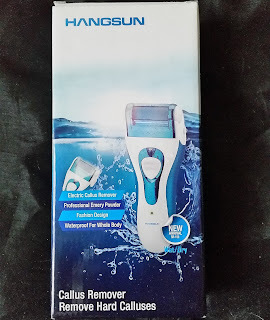 Only use the callous remover on dry skin and only on your feet, no where else on the body. 1. Wash and clean the skin, dry fully. 2. Make sure the callous remover is placed into the unit. 3. Push the switch up and gently rotate back and fourth or side to side over the callous/corn/hard skin area for 2-3 seconds. Do not press hard-gently glide the device over desired area. The unit will stop when pressed too hard over skin. Turn unit off and check if you achieved the softness you desire. If not, turn on the device and repeat, stop and check again. Continue to use this method until the level of smoothness is obtained. STOP using if skin becomes sore or inflamed. DO NOT use on skin for more than 2-3 seconds at a time. 5.Rinse the skin or use a wet towel to get rid of the excess dead particles. 6.To clean the device, remove the callus remover roller from device, rinse the device under the tap for 5-8 seconds. Wipe the body of the device with a clean dry cloth. The device is water resistant waterproof. The device is really easy to use, flick the switch up and you see and hear the roller rotate, the rotation rate is 4200RPM so quite fast! The LED light comes on and you position the device where u need it to work its magic. I placed lightly over my skin and tried both methods (back and fourth) (side to side) and both gave me the same results, smooth skin! Now I'm not going to lie i thought i would feel some sort of discomfort or pain, but i didn't. The soft and no pain technology to remove dead skin really is that, no pain! Its amazing just how different your feet feel when they have been treated and that's what your feet deserve, they are the ones who take the brunt of our lives by fashion trend footwear and daily schedules that have us running around on them all day.